WASHINGTON — Georgia holds runoffs on Tuesday for the contests where no candidate surpassed 50 percent of the vote in the original May 22 primary races, and the marquee contest today is the GOP gubernatorial runoff between Lt. Gov. Casey Cagle and state Secretary of State Brian Kemp. This runoff has lasted more than two months since the original primary — giving Dem nominee Stacey Abrams a significant head start for the general election — and it has included leaked audio of Cagle (saying the contest was focused on “who had the biggest gun, who had the biggest truck and who could be the craziest”), plus a presidential endorsement (Trump backing Kemp). In the May 22 primary, Cagle got 39 percent, and Kemp got 26 percent. There is no real ideological difference between Cagle and Kemp — it isn’t Conservative vs. Moderate, or Trumper vs. Never Trumper — but political observers consider Kemp the weaker general-election candidate given his provocative TV ads on immigration (here) and guns (here). So a Kemp-vs.-Abrams race could really be a battle between the Dem and GOP bases. (It also raises the question: Did Trump endorse the weaker general-election candidate? And if so, why?) 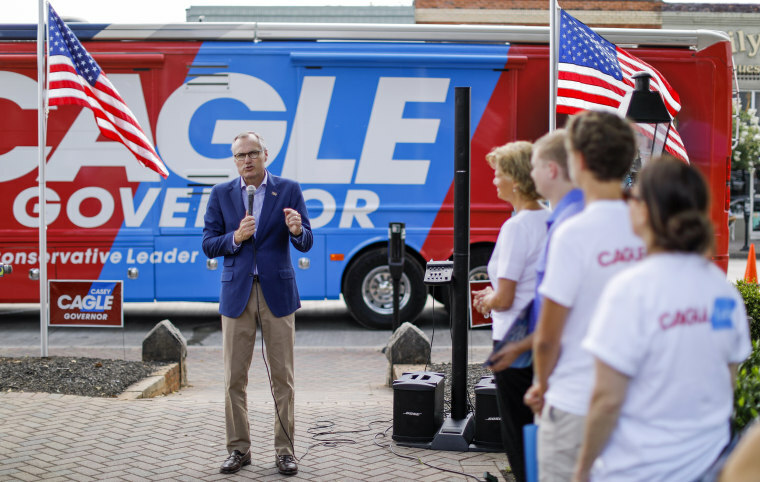 Still, observers say not to count out Cagle tonight night. And regardless of who wins the runoff, Georgia is still a GOP-leaning state, and the Republican nominee will be the favorite to win in November. The other runoff to watch in Georgia tonight is on the Democratic side — for the GA-6 district. (If that district sounds familiar, it’s where Democrat Jon Ossoff lost and Republican Karen Handel won last year.) Tonight’s Dem contest in GA-6 is between EMILY’s List-backed activist Lucy McBath (whose son Jordan Davis was killed for playing music too loudly in his car) and technology consultant Kevin Abel. The DCCC hasn’t taken sides in this race. The winner faces Handel in a race the Cook Political Report has as “Lean R.” NBC’s Ben Kamisar reports that Everytown for Gun Safety dropped $100,000 in the last week to help boost McBath. And in the GA-7 district, which the Cook Report labels as “Likely R,” Democrats Carolyn Bourdeaux and David Kim face off in a runoff for the right to take on Rep. Rob Woodall, R-Ga., in November. Polling places in Georgia close at 7:00 p.m. ET. As we wrote last month, one of the clues we missed about Trump in 2016 was his over-performance among voters who disliked BOTH Trump and Hillary Clinton. These voters made up 18 percent of voters in our merged NBC/WSJ polls of 2016, and they disproportionately broke for Trump and the GOP on the generic ballot. What’s more in our current poll, these voters disproportionately are down on Trump (68 percent disapprove of his job, versus 52 percent of all voters), and they are enthusiastic about the upcoming midterms (63 percent of them have high interest, versus 55 percent of all voters who say this). Those numbers above are good news for Democrats in the NBC/WSJ poll. Here’s some bad news, however: Democratic candidates for Congress are increasingly seen as out of the mainstream — a change from 2012 and 2016. According to our poll, 33 percent of voters view Democratic congressional candidates as in the mainstream, versus 56 percent who say they are out of step. That’s essentially the same score that GOP congressional candidates get — 33 percent mainstream, 57 percent out of step. But the 33 percent viewing Democratic candidates in the mainstream is a drop of 15 points from 2016 and 12 points from 2012 (while the GOP numbers have been pretty flat). And here’s another set of numbers from our NBC/WSJ poll that we released yesterday: 71 percent of voters don’t want the Roe v. Wade abortion decision to be overturned — an all-time high in the survey — and that includes 52 percent of GOP voters. Just 23 percent of all voters believe Roe v. Wade should be overturned. “President Donald Trump is examining whether to revoke the security clearances of former intelligence officials who have criticized him, his spokeswoman said Monday, raising the specter of a president using his office to lash out at his political critics,” NBC’s Ken Dilanian writes. “White House press secretary Sarah Huckabee Sanders told reporters that Trump is considering yanking the security clearances of former CIA Director John Brennan, an NBC News contributor; former FBI Director James B. Comey; former CIA Director Michael V. Hayden; former National Security Adviser Susan E. Rice; former Director of National Intelligence James R. Clapper Jr.; and former FBI Deputy Director Andrew McCabe.